A great and beloved man, Reynaldo Sanchez (Major General, Ret.) passed away at the age of 86 in El Paso, Texas. Reynaldo (AKA “Rey,” the “General,” “Coach,” “Uncle” and of course “Padre” by his son) embraced a life of service to others, placing his beloved wife “The Yellow Rose of Texas” at the top and his family at the center of his life. Rey’s first date with lovely sophomore, Rose Romo, when he was a senior at Jefferson High School was the start of a lifelong romance. 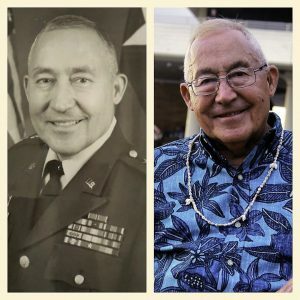 He earned a Bachelor of Science in Civil Engineering through ROTC at UTEP (then Texas Western College) in 1957, was commissioned in the Army, and married Rose. The pair, joined in 1959 by their son, Derek Sanchez, enjoyed duty stations in Germany, Arkansas, Korea, Oklahoma, Vietnam, Kentucky, and finally Puerto Rico. His total record of service in both active duty and reserve capacities spanned 39 years. While on reserve, he also had a career as a Civil Engineer with the U.S. Bureau of Reclamation, Department of the Interior. Along the way, he earned an MBA at the Inter American University in Puerto Rico and a Master of Science at UTEP (did we mention he loves UTEP?). He left service in the regular Army in 1972 as a Major and retired as a Major General and the Commander of Detachment 1 of the Texas Army National Guard in 1994. Rey embodied both a “joie de vivre” and a “go for it!” attitude. In the military, he was a leader with his troops’ welfare always in mind, placing duty above all, for which he was repeatedly commended. Noteworthy among his numerous decorations is his receipt of the Legion of Merit awarded to those “who have displayed exceptionally meritorious conduct in the performance of outstanding services and achievements. The performance must be of significant importance and far exceed what is expected by normal standards.” He was also decorated with the Bronze Star, awarded to individuals for “heroic or meritorious achievement or service…while engaged in military operations involving conflict with an opposing foreign force.” He received the Vietnam Cross of Gallantry with Palm and the Vietnam Campaign Medal, citations awarded by former President Nguyen Van Thieu to U.S. military service members for their valorous service in trying to protect and preserve the Republic of South Vietnam. He earned medals for honorably serving during the Korean War, and received Texas National Guard commendations — the Lone Star Distinguished Service Medal and Texas Outstanding Service Medal. Rey’s post-military life continued to be rich and full of service to others. Innumerable young people were influenced by him as a volunteer T-ball and youth basketball coach and inspirational public speaker. His later years stayed busy with travel to watch his great-nephew and niece, Amanda and Mark Torrez, participate in football and cheerleading, taking great pride in their athletic prowess. He loved to travel and remarked frequently about a trip taken with Derek, Beth, and Nate to Hawaii in 2017. He was animated in his joy of life and loved to share, with mischievous grin, his love of his morning coffee (flavored gently with a splash of Jack Daniels). MGen (Ret.) Sanchez was preceded in death by his wife, Rose (Romo) Sanchez and his parents, Jesus and Josefina Sanchez and brothers Jesus “Nunito”, Eduardo and John Sanchez. He is survived by one son, Derek Sanchez and wife Beth Senger (and children Nate and Becca), and by his great grand-nephew Dallas Braxton, whom Rey and Rose raised along with Dallas’ partner Victoria and children Isaiah Kai, Beau Aubry, and Dallas Rose. Blessed with a large and loving family, Rey enjoyed close and loving relationships with and is survived by niece Yara and her husband Guillermo “Willy” Diaz, great-niece Yvette and her husband Mark Torrez (along with children Mark and Amanda). His life was further enriched by his own and his wife’s brothers and sisters. He is also survived by his brother, Jesus and Carmen Sanchez, and sisters Dolores and Augustin Nakamoto, Yolanda and Robert Chavez, and Maria del Refugio Pantoja. Rey, General, Coach, Padre we honor you and we miss you. We can never thank you enough for everything you’ve done for so many of us. You inspired us with your constant “thumbs up” in the hospital. When you were asked how you were, “better today than yesterday” was your immediate answer as you waited eagerly for physical therapy. You were always positive and you embraced everyone you met instantly as a friend and member of your family. Your unflagging optimism, good cheer, and willingness to try anything, go anywhere, and relish every moment of every day sets an example for us all. “Joie de vivre.” Enjoyment of life. We love you so much and hope you’re enjoying dancing with your Yellow Rose of Texas right now. Goodbye for now, old soldier. I have fought when others feared to serve. I have gone where others failed to go. Who valued Duty more than love of life. I have shared the comradeship of pain. Who would fight to see that other stricken lands are free. I have seen the weak forsake humanity.